Do you ever have trouble falling asleep (or staying asleep) at night? Those are the nights you need The Nocturnal Journal, an insightful and engaging little book that will help you at least pass that time productively. No matter the reason you can't sleep, I'm willing to bet that Crutchley has an activity for you. There are two things that make this an especially useful little book. First, there are lots of different reasons why someone might have problems sleeping at night, and Crutchley gives activities for five categories of them. Obstructions (the things in your way personally or professionally), Fears, Light (those awesome inspirations that can come just as you're ready to fall asleep), Dark (as in dark feelings and thoughts), and You (big questions about identity, where you're headed, etc.). No matter the reason why you can't sleep, there's a segment of the book with journaling prompts, doodling assignments, etc. to help you work through your issue. Which leads me to the second reason why I love The Nocturnal Journal: the sheer variety of activities. Let's face it, sometimes you just don't to want to write a big, long journal entry. Especially when you're sleep deprived. Crutchley to the rescue! There are thinking assigments, scales to rate yourself on various personality traits, spaces to draw out what's on your mind, meditations and visualizations, annotated lists to make, guided reflections, and more. I started having problems sleeping in my early- to mid-teens. 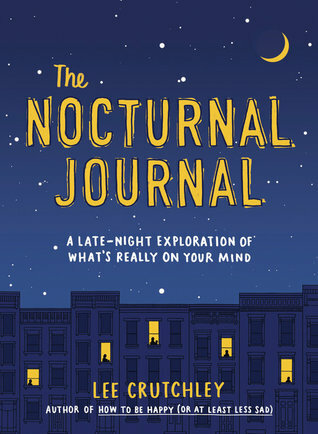 And being nearly a life-long, chronic insomniac, I have to say that The Nocturnal Journal is a brilliant little book. If you are also a person who sometimes has difficulty getting the mental hamsters off the brain-wheel at night, this could be the book for you. Grab a copy for your night-table, throw a pen and a couple of colored pencils in the drawer, and you'll be well-armed for your next sleepless night. Bonus: the cover glows in the dark! Very cool that the cover glows in the dark.